Ladies, what is your handbag worth? handbag? Or maybe you’re someone that carries everything around with you too? 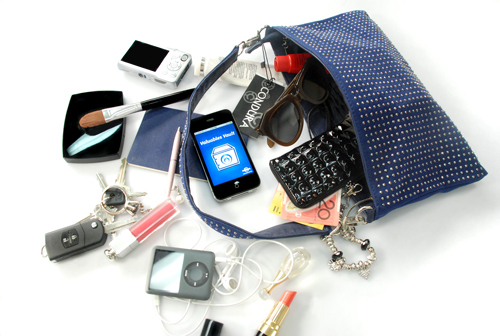 A study by NRMA Insurance shows that MP3 players, cameras, sunglasses, mobile phones and handbags were some of the most popular items with thieves in the last financial year. Many women carry so many valuables in their bag that the analogy of carrying our lives in a handbag is a real one. Not surprisingly, more than 95% of women carry a wallet, almost 90% carry a mobile phone and 60% carry sunglasses in their handbags most days. Personal documents (50%) make-up (46%) and fragrance (33%) were also carried most days. With a total average value of $2,094.75!
. Take photos of valuable items and keep proof of purchase receipts to make replacement easier. NRMA Insurance recommends consumers add portable valuables cover to their home contents insurance for expensive items taken out of the home. What’s your one handbag essential?